A Jewish shop, Nov. 10, 1938, the day after the pogrom. Eight decades have now passed since the infamous night known as “Kristallnacht.” A more apt description would be “Reich’s pogrom night,” when a wave of Nazi-orchestrated, preplanned, deadly riots took place against Jews throughout Germany and Austria. On November 9–10, 1938, fourteen-hundred shuls were set ablaze; sifrei Torah and many other sefarim went up in flames. Firefighters stood by — but only to ensure that the flames didn’t damage properties owned by Aryans. Homes were invaded and the Jewish owners were forced to wrap up and hand over their valuables. 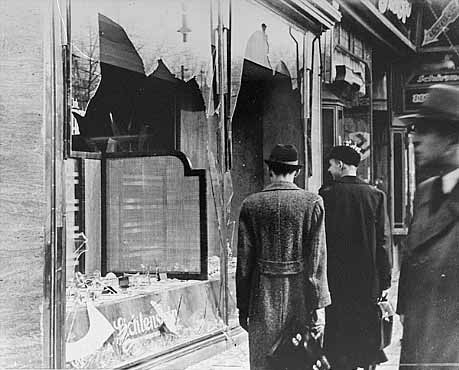 7,500 Jewish-owned businesses were ransacked, their windows shattered, and their contents looted. Jewish hospitals, orphanages and old-age homes were attacked and their occupants forced out. SS thugs assaulted thousands of Jews and the Gestapo arrested 30,000 Jews, and sent them to concentration camps, marking the first such mass deportation. In all, at least 90 Jews were murdered. World War II technically began in September of 1939. But for the Jews of Germany and Austria, the horrors of what would later be known as Churban Europa had already begun: Kristallnacht was a turning point in Hitler’s plan for the Jews. From a contemporary perspective, it is very challenging to comprehend the seismic shift in the way the Jews were treated in countries that were considered among the most cultured in Europe, if not the world. In an interview she gave before her passing, Mrs. Manja Fink, a”h, recalled how when her grandfather, Harav Yitzchak Meir Heschel, the first Rebbe of Kopyczynitz, was niftar in September of 1935, on the day of his levayah the non-Jewish neighbors closed all their stores as a sign of respect. “Then when Hitler came in, three years later, my father [the Kopyczynitzer Rebbe, Harav Avraham Yehoshua Heschel, zy”a] was one of the first to be taken,” Mrs. Fink recalled. The once respectful, even friendly neighbors and members of the Austrian police were suddenly transformed into bloodthirsty brutes. Along with other Rebbes and community leaders, her father and his family were viciously harassed and persecuted. All their valuables — including priceless ancestral heirlooms — were confiscated, never to be seen again. The Kopyczynitzer Rebbe was eventually able to escape Vienna, but his younger brother Moshe, Hy”d, as well as numerous other members of his family and Chassidim, were deported and murdered. With the passage of time, the number of remaining survivors who still recall those nights — the youngest of whom are in their upper eighties — is dwindling. It is now up to the younger generation, the children, grandchildren, and the great-grandchildren of the survivors to ensure that what happened to our people is never forgotten. In this week’s Inyan magazine, we present four eyewitness accounts to this period in our history. Transcribed from Project Witness Media, they tell of the horror and heartbreak, but also of miracles and introspection. In the Features section, our European correspondent explores how contemporary Germany and Austria grapple with their roles in these most terrible events, as well as what Jewish life is like today in Vienna and Germany. The tragic attack in Pittsburgh ten days ago underscored the reality that even in 2018, even in the great malchus shel chessed that is America, there are no guarantees. Eleven Jews were viciously killed only because they were Jews. We will only be truly safe when Moshiach will come. Until then, our consolation is the very fact that against all odds, in one of Hashem’s greatest miracles, we not only survived as a people but rebuilt out of the ashes. The Nazis and their willing accessories did all they could not only to massacre Jews — but to erase Yiddishkeit. But in the end, they did not succeed. Most of the shuls that were burned down on Kristallnacht were never rebuilt. But with much siyatta diShmaya, a great many other shuls have been rebuilt in other cities throughout the world since then. Most of the sifrei Torah that were pillaged were not recovered, but, baruch Hashem, a great many sifrei Torah have been written and sefarim published over the past 80 years. Torah study is flourishing throughout the globe, and Yiddishkeit is blossoming. Ultimately, hordes of evil failed to eradicate what they despised the most. As we recommit ourselves to remember those dreadful days, we recognize that the sweet sounds of children learning Torah and the communal tefillos in shuls throughout the world are the greatest possible revenge and the most powerful response to the Reich’s pogrom night.